Histamine naturally occurs in the body and is released during allergic reactions and times of stress. Histamine is also present in certain foods and is broken down by the enzyme diamine oxidase. According to the British Allergy Foundation, some people produce lower amounts of diamine oxidase, which results in a histamine intolerance and causes diarrhea, headache, asthma, rash, low blood pressure, irregular heartbeats, hives and itchy skin. There is no cure for histamine intolerance, but avoiding foods with histamine can alleviate or prevent symptoms. German researchers from the University of Bonn published an article in 2007 in the "American Journal of Clinical Nutrition" (AJCN) that identified high-histamine foods. Fish high in histamine include mackerel, herring, sardines and tuna. Some fish are also associated with scombrotoxin, a histamine toxicity caused by improperly chilled fish. Scombrotoxin can cause burning around the mouth, facial flushing and diarrhea. The Queensland Health in Australia says the fish most commonly associated with scombrotoxin are mackerel, tuna, bonito, sardines, marlin and butterfly kingfish. 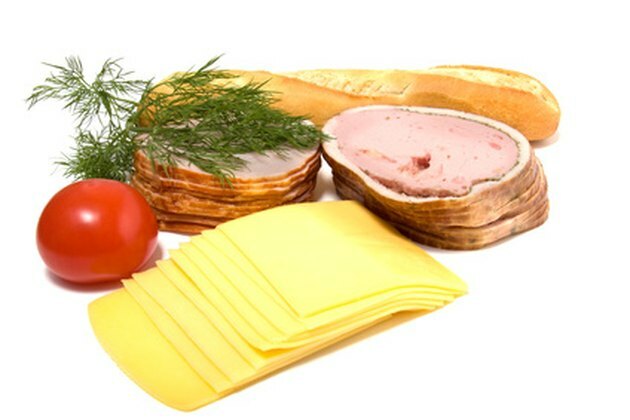 According to the Michigan Allergy, Sinus and Asthma Specialists (MASAS), fermented, aged and processed meats and cheeses are high in histamine. This includes salami, sausage, ham, hot dogs, deli meats and dried meats. Cheeses that meet the criteria are blue cheese, parmesan, gouda, camembert, cheddar, emmental, swiss, brie, and gruyere. Sauerkraut, pickles, olives and other vegetables that are pickled or preserved are high in histamine. Fresh vegetables that are naturally high in histamine and eliminated on a restricted diet are tomato, eggplant, pumpkin, avocado, mushroom and spinach. Tomato products like ketchup, chili sauce and canned tomatoes should also be avoided, according to the British Allergy Foundation. All types of alcohol have histamine, but the "AJCN" article lists wine, beer and champagne as the alcoholic beverages with the most histamine. Additional foods that may provoke a histamine reaction include foods with artificial colors and preservatives, chocolate, commercial candies, fermented soy products, flavored milk, carbonated beverages, tea, fermented or soured milk products, chicken, soured breads, yeast products, smoked fish and homemade rootbeer. The MASAS indicates that dried fruits are high in histamine but may be tolerated if washed. The MASAS also says that there are certain foods that do not contain histamine themselves but will trigger histamine release, which can cause negative side effects. Possible histamine-releasing foods include alcohol, bananas, chocolate, fish, milk, papayas, pineapple, shellfish, raw egg whites, strawberries and tomatoes.